At 950 feet in the air, the mountains-to-sea view is dramatic, but NoHo-raised chef Vartan Abgaryan gives the eye plenty to gaze at on the plate. A sliver of foie gras terrine rests languidly beside grilled, big-crumbed country bread. 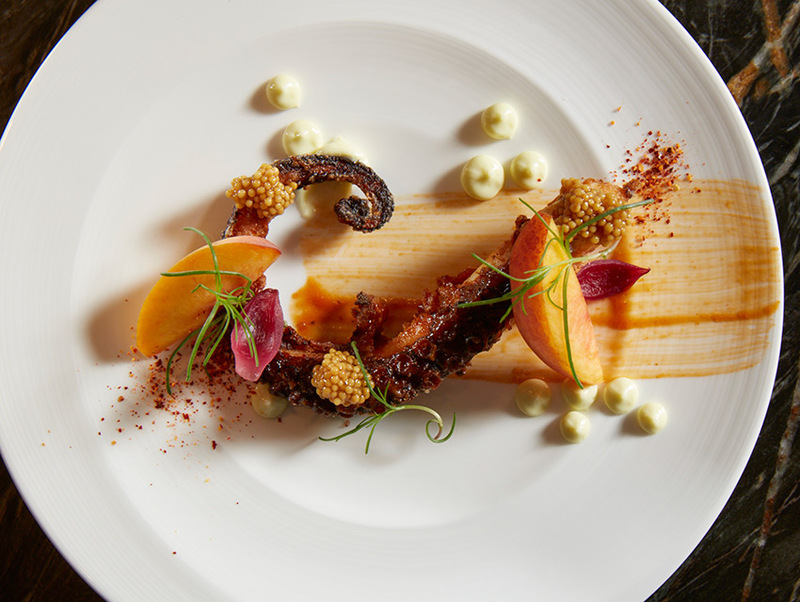 Tart mustard seeds contrast with the char of an octopus tendril in the same way crackling chicharronnes play off a refined arrangement of king crab petals. The experience is luxury that reflects on-point execution, not airs. Golden as florins, crisp shingles of pommes Maxim slope across a mound of steak tartare, while a dark roasting jus drapes over the truffled chicken breast. At the white oak chef’s table, an office party is caught up in conversation. Taking the panoramic phone pic can wait until the last praline almond on a caramel custard has been consumed. —P.K.